Technology cannot be effective in the classroom without teachers who are knowledgeable about both the technology itself and its implementation to meet educational goals. While technology use in the classroom is increasing, improving learning through its application should remain the goal. In this study, the authors explored 74 middle school teachers’ beliefs about and use of technology through a technology, pedagogy, and content knowledge (TPACK) lens. They sought to understand how middle school teachers use and perceive technology in practice and the factors influencing their pedagogical decisions to incorporate technology into their practice. Data included surveys, administered after a science, technology, engineering, and mathematics (STEM) outreach program and teacher interviews. Findings revealed that both internal and external barriers were present and influenced how teachers situated their pedagogy in terms of technology integration. It was also found that teachers were confident in content, pedagogy, and technology; however, most viewed technology as a tool rather than an embedded part of the learning process. This study contributes knowledge about professional development initiatives and the need to address not technology knowledge as much as the interdependence of technology, pedagogy, and subject content matter. In Canada, there continues to be a shortfall of students entering science, technology, engineering, and mathematics (STEM) degree programs. In 2013, a report from Statistics Canada on the gender differences in university programs revealed that 40% of men and 20% of women entering a university program were entering STEM programs, with the majority of first-year students entering degree programs in social studies and business (Hango, 2013). What continues to be troubling is that, despite women performing well in mathematics and science on the Programme for International Student Assessment (PISA), they are less likely to choose a STEM degree program than are their male counterparts, even when their PISA scores in mathematics and science are higher. Much research has examined why women are less likely to pursue studies in STEM fields, and common themes of low self-confidence, lack of interest, and lower expectations abound in the literature (Hayden, Ouyang, Scinski, Olszewski, & Bielefeldt, 2011; Sadler, Sonnert, Hazari, & Tai, 2012; Weber, 2012). For students, a significant decision-making period about possible careers occur in middle school, so much so that by the time a student enters Grade 9, their career destination is already firmly established in favor of or opposed to STEM fields (Sadler et al., 2012). Considerations then need to be made during this time to support the efforts made by middle school teachers to increase students’ contemplation of possible STEM career pathways (Iskander, Gore, Furse, & Bergerson, 2013). One possible way to affect students’ beliefs is the integration of certain technologies into classroom practice. The Ontario government announced in 2014 that they would invest $150 million dollars over 3 years to support the integration of technology into the classroom (Government of Ontario, 2014). This integration includes improving both access and support for students and teachers, including purchase of devices (tablets, netbooks, and cameras) and software, improvement of connectivity, and teacher professional development. What technologies do teachers currently integrate in their classroom? What factors influence teachers’ decisions to integrate technology in their classroom? How do teachers use the TPACK framework in their decisions to integrate technology into their classroom? This work provides further insight into how teachers are using technology in the classroom and can impact programmatic development in STEM and inform teacher professional development and teacher education programs as to best practices for effective technology implementation within a TPACK framework. We explored middle school teachers’ decisions to use technology in their classrooms through the lens of the TPACK framework (Koehler & Mishra, 2005). TPACK, described as the intersection of three types of knowledge (technological, pedagogical, and content or subject specific; see Figure 1), is a framework used by researchers to better understand how teachers support student learning through technology integration in their practice (Voogt, Fisser, Pareja Roblin, Tondeur, & van Braak, 2013). Figure 1. The TPACK framework (adapted from Koehler & Mishra, 2009). The TPACK framework has been demonstrated to be an effective means for examining teacher education programs (Günes & Bahcivan, 2016; Nordin & Faekah, 2016; Özdemir, 2016) and has led to significant recommendations regarding subject-specific pedagogical instruction, information and communications technology (ICT) education, and increased opportunities for the use of technology in teacher education programs. For teachers to integrate digital technologies into their practice, they need an ever-evolving understanding of which technologies exist and their functionalities (technological knowledge or TK). Baturay, Gökçearslan, and Sahin (2017), in their exploration of teacher use of computer-assisted education and its relationship to gender, found TK to be the biggest indicator of technology inclusion in practice, with males reporting higher TK than females. In addition to TK, Koehler and Mishra (2009) explained that teachers are required to be creative and flexible when using technologies in the classroom, recognizing that integrating technologies shifts the pedagogical landscapes of the classroom (technological pedagogical knowledge or TPK). Teachers also need to have a deep understanding of technology’s influence on content areas (technological content knowledge or TCK). TPACK is – in addition to mastery of content knowledge, pedagogical knowledge, and pedagogical content knowledge – the integration of these practical and theoretical types of knowledge. Skilled teachers artfully incorporate technologies to enhance student learning by capitalizing on their capabilities to support and promote learning, while at the same time they are cognizant of the interdependence of technologies and subject content area (Koehler & Mishra, 2009). In science education, Jimoyiannis (2010) discussed the integration of these three types of knowledge as “what science teachers need to know about [ICT] in science education” (p. 1264), where technologies (such as computer simulations) can support students in their understanding of science (Khan, 2011). Part of the ongoing challenge is the rapid evolution and availability of technologies. School boards make decisions about which technologies are permissible and available, and from those, teachers are ultimately left to make decisions regarding which technologies they will incorporate into their classrooms. Research in recent years shows that teachers have been using the available technologies (Hechter & Vermette, 2014; Kong & Song, 2014; Kyriakides, Meletiou-mavrotheris, & Prodromou, 2016; Ruggiero & Mong, 2015; Uluyol & Sahin, 2016; Zimlich, 2015). Teachers primarily use presentation technologies (Uluyol & Sahin, 2016), however – and even more so in secondary schools (Ruggiero & Mong, 2015) – with online discussions, podcasting, Web 2.0 technologies, and simulation software utilized the least (Hechter & Vermette, 2014; Ruggiero & Mong, 2015). Unfortunately, technologies that are least used tend to have greatest impact on student engagement for both males and females (Hayden et al., 2011). When students use technology (such as online class discussions with classmates or collaborating with others in the global community via the Internet, conducting research, using animation-based online learning or digital video games), it empowers them to the extent that they are more engaged with science learning (Kyriakides et al., 2016; Mistler-Jackson, & Songer, 2000) and are intrinsically motivated (Kong & Song, 2014; Shroff, & Vogel, 2009; Wang & Reeves, 2006), as well as demonstrating increased interest (Rosen, 2009; Zimlich, 2015) and improved attitudes towards science (Hayden et al., 2011). These technologies (e.g., for design, communication, and social interactions) are also preferred by middle school female students (Weber & Custer, 2005). Similar trends have been reported by Mims-Word (2012), who found that although both male and female middle school students were equally enthusiastic in terms of using technology, girls viewed the computer primarily as a communication tool, perhaps resulting from influences in the home beginning as early as kindergarten. Given the aforementioned considerations, we explored the choices and challenges teachers face when incorporating technologies into their practice. The 3-year longitudinal study reported here followed a sequential explanatory mixed-methods design (Creswell, 2014; Mills, Dupreos, & Wiebe, 2010). This methodology facilitated the collection and analysis of both quantitative (surveys) and qualitative (interviews and reflections) data. The study was launched in an effort to support the positive development of middle school students’ attitudes toward and interest in STEM education. To this end, multiple stakeholders, including a Canadian university, an outreach provider, the business sector, and a large Canadian school board collaborated to help meet the overall aim of the project and answer specific research questions related to the impact of outreach programs on STEM preparation in the early grades. The business sector selected the participating schools to meet each school’s unique needs. Participants in the study included teachers, students, and administrators from 95 Grade 6, 7, and 8 classrooms (74 teachers and approximately 2,500 students) in four schools of similar profiles, as identified by the Social Risk Index. Even though the schools included in this study are considered high risk, they are part of a school board that promotes the use of technology in the classroom through relatively seamless wireless access, with an onsite supply of devices for students unable or unwilling to bring their own to class. Student participants attended two half-day, hands-on inquiry-based STEM workshops, conducted by scientists and engineers, in each year/phase of the study from Grade 6 through Grade 8. In total, they attended six workshops per student, or 540 workshops over 3 years for 2,500 students. During the OProg workshops, each of the 74 teachers were involved in six workshops over the 3-year study and assumed various roles, including supervision, cofacilitation, and other professional activities. This paper reports on a subset of teacher data, including 74 teacher participants (25 males and 49 females) from diverse ethnic backgrounds, including Afro-Canadians, Middle Eastern, Caucasian, Asian, and South East Asian. Participants taught Grade 6, 7, or 8, and their teaching experience ranged from 2 to 37 years (see Figure 2). Figure 2. Participants’ gender and teaching experience. Data sources included surveys and semistructured interviews. Teacher participants completed the Teacher Efficacy and Attitudes Toward STEM (T-STEM) survey [a], validated and tested for reliability through the National Science Foundation. All scales on the instrument were found to have Cronbach’s alpha internal consistency reliabilities over 0.80 (Erkut & Marx, 2005). The STU scale provided insights into teachers’ beliefs about the role and value of technology in the classroom and its potential to support the development of student attitudes toward STEM. Seventeen teachers (nine males and eight females) volunteered to participate in semistructured interviews (deMarrais, 2004) exploring STEM teaching, understandings, and beliefs, as well as specifics related to their teaching practice, including pedagogy, curriculum, outreach programs, and the integration of technology into their practice. Quantitative data were analyzed using descriptive statistics (SPSS). Qualitative data were analyzed through an interpretational analysis framework using NVivo 11 data analysis software and executed through the process of thematic coding and constant comparative method (as in Stake, 2000) to address the research questions. Transcripts were imported into NVivo, and quotes were selected based on their inclusion of TPACK elements, including content knowledge (CK), pedagogical knowledge (PK), TK, pedagogical content knowledge (PCK), pedagogical technological knowledge (PTK), and TPACK. The spreadsheet software MS Excel was used to create figures. In exploring teacher integration of technology into their classroom practice, we gathered data and mined for themes related to both teacher and their student’s uses of technology. The results are discussed in three sections as they relate to the overarching research questions addressed in this paper: (a) Use of technology in the classroom (including frequency and purpose) and, specifically, the kinds of technologies used; (b) factors influencing decision- making in terms of integrating technology into classroom practice; and (c) teacher decision to integrate technology using a TPACK framework. In addressing the first research question we examined the reasons teachers use the technologies they do and, specifically, what technologies they use to this end. Technology in the Classroom. Survey findings revealed that teachers reported integrating technology into the classroom (3.03). When asked how often they use technology in their practice, 47% of respondents described their technology use as frequently and 23% as everyday. When prompted to respond to why they use technology, each of the following themes appeared in 29% of responses: proficiency for the modern world and research. The themes recording and visuals, illustration of a concept each occurred in 17% of responses. In terms of how teachers integrated technology in their practice, 35% said research, while 29% said visuals, presentation. Three participants (17%) mentioned online classroom interactions, and two (11%) mentioned learning new software, apps (Figure 3). Figure 3. Technology use by teachers identified in interviews. Teachers in this study indicated that they used a variety of technologies for multiple reasons in their classrooms. Emergent themes of motivation – “Try to keep it fun if possible, and involve the students. … I’m trying to use technology more when I can, and use computers when we can,” and, “Because I think it’s important for the kids to be comfortable with it, because they are going to be using it” – and accessibility were highlighted in the interview data. Survey data revealed that teachers identified student use of technology as slightly more positive than neutral, and included accessing online resources (3.68), working on projects (3.11), problem solving (3.27), supporting higher order thinking (3.03), and generating new ideas and representing information (3.14; see Table 1). Both online collaboration (2.57) and the use of researchers’ professional tools (2.19) were rated slightly negatively by teachers. Types of Technology. 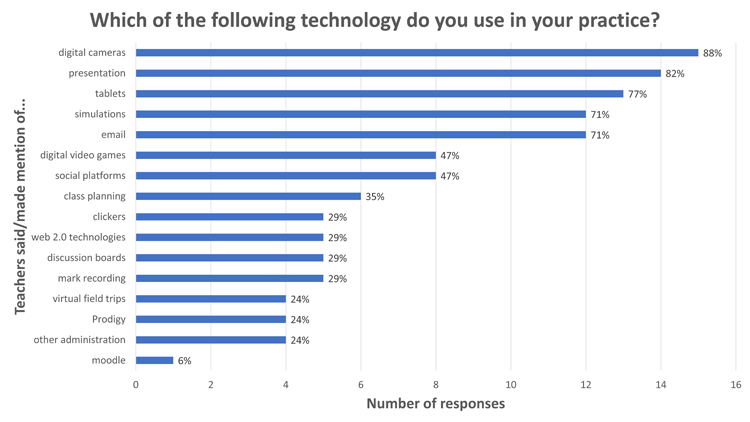 Within the interviews, teachers responded to questions about specific types of technologies used in the classroom (Figure 4). The most commonly used technology was digital cameras (88%), followed by presentation (82.4%), and tablets (including Chromebooks; 77%). Simulations and email followed (71% each), then digital video games and social platforms (47% each) and class planning (35%). Four technologies were each reported by 29% of respondents: clickers, Web 2.0 technologies, discussion boards, and recording marks. Three technologies were each reported by 24% of respondents: virtual field trips, Prodigy, and other administration tasks. Only one respondent reported using Moodle (6%). In exploring the second research question, teacher demographics including gender and teaching experience were considered possible factors influencing their decisions to use technology. Interview findings identified a third influencer, teacher readiness, referring to factors teachers identified as empowering, encouraging, overwhelming, challenging, or other type sentiment. Gender. A Spearman correlation was conducted to explore the relationship between teacher gender and reported student technology use, as literature exploring the role of teacher gender on the decision to incorporate technology into classroom practice is sparse. Results from this study demonstrated a weak correlation, r (35) = .19, p = .25, with female teachers (3.17) reporting more student technology use than male teachers (2.58). Teaching Experience. A Pearson correlation was conducted to explore the relationship between teaching experience and reported student technology use. Results from this study demonstrated a weak negative correlation, r (32) = -.02, p = .91, with less student technology use reported by experienced teachers (16-20 years, 2.43) and more student technology use reported by teachers with 11-15 years teaching experience (3.38). Teacher Readiness. Teachers reported that the abundance of technology presents a challenge in terms of decision-making and choice as to which technologies to integrate into their lessons. They also noted in the interviews that some forms of technology take more time to set up than their perceived value. Table 2 illustrates types of knowledge identified by the TPACK framework, in association with technological knowledge. How often do you use technology in your practice? Why do you use technology? 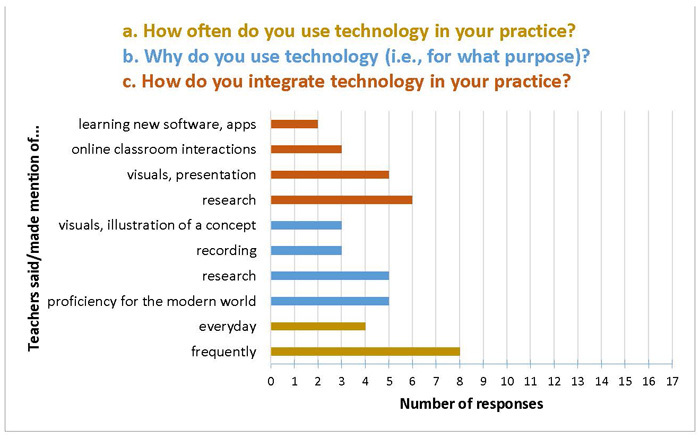 How do you integrate technology in your practice? The most commonly identified knowledge was TPK (82%), with the majority reported as positively developed. TK was reported as the second most commonly identified knowledge (65%), with the majority indicating a positive development. The least frequently identified types of knowledge included types of technological knowledge that intersected with content, with only four instances of TPACK (100% positive) and three responses for TCK (67% positive). Teachers did not identify any challenges associated with content knowledge. The teachers who participated in this study represented a wide range of opinions and thoughts about the integration of technology into the classroom. Most expressed an interest in learning more about technologies, others reported that they had altogether abandoned using some technologies due to the lack of resources and time constraints for learning new technologies, and some were skeptical about the benefits of using technologies. The findings are next considered through the lens of a TPACK framework, followed by recommendations for effective supports for teachers as they move toward a more consistent TPACK framework for their classroom practices. The OProg was primarily targeted to students in an effort to develop their awareness and positively impact their attitudes toward STEM. Teacher professional development focusing on STEM attitudes and interest was a secondary outcome, which explains why no significant change regarding teacher technology use occurred. We consider this data cautiously, as Hechter and Vermette (2014) found that teachers often overreported technology use by students. Our findings that teachers use technology in the classroom is congruent with studies (Hechter & Vermette, 2014; Kong & Song, 2014; Kyriakides et al., 2016; Ruggiero & Mong, 2015; Uluyol & Sahin, 2016; Zimlich, 2015), as are the types of technologies teachers selected. Interestingly, our study found that female teachers reported more student use of technology when compared with male teachers. For all teachers, the range of uses of technologies varied, even within their own administrative practices (not all use mark recording programs, and some no longer use email, but prefer messaging), but more consistently teachers used those technologies that support access (general web searches) and dissemination of knowledge (presentation software, such as Prezi and PowerPoint, and YouTube videos). Few teachers reported using sites that promote online collaboration (2.57), with comments that reflect a range of reactions, from hesitation, “I have still a little bit of a phobia in making dramatic statements that … one liners, so I’m not myself proficient at Twitter and that type of thing” (Male #12) to dismissive, “Discussion boards? No. Live discussion is what I use in class” (Male #3). These responses are of concern considering Weber and Custer (2005), and Mims-Word’s (2012) findings that communication technologies encourage female student participation. Without the inclusion of technologies that are found to increase female student engagement, their interest in technology cannot be capitalized upon. An inference may be made that teacher enhanced TK will translate into increased use of a variety of technologies in the classroom (Baturay et al., 2017). Despite female teachers in our study reporting more overall student technology use, the limited opportunities for students to engage with technologies beyond information capture and dissemination impedes student TK development. 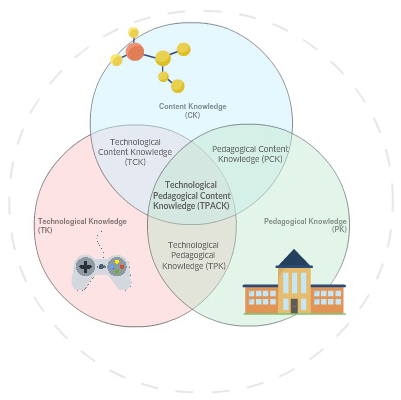 While teachers envisioned where they could use technologies through the lenses of TK and TPK, there is little evidence that teachers understood the scope of the interdependence of technology with content, or how the intersection of all three TPACK domains of knowledge can be used to fully realize the potential technology affords. Four teachers (three male, one female) described using projects and approaches that successfully utilize a TPACK framework. For example, one teacher described her integration of technology through a TPACK framework in that (a) technology shaped her students’ work; (b) technology was used to gather and share data with professionals; and (c) shared data was used by professionals through a citizen science project. For the remaining 13 teachers interviewed, technology was viewed more often as a tool rather than part of an integrated process. Factors that may have potentially influenced the teachers can be categorized as both external (resources, training, and support) and internal (personal investment in technology, attitude toward technology, and peer support) barriers, as described by Ruggiero and Mong (2015). External barriers, such as access to computers (Hecter & Vermetter, 2014) and websites (Zimlich, 2015), were identified in this study. This result was surprising considering the school board’s positive and access-for-all technology policies. Nevertheless, teachers spoke about access to devices, such as type of devices, numbers, and those that are dated; board platforms from home; and school Wi-Fi access. For teachers to move toward a TPACK framework they must be able to effectively use the technology, which requires reliable access. The second most common theme identified was a misalignment between the purpose of the technology and teachers’ expectations of the technology. Some challenges were about compatibility, for example, “The other thing has been access to certain apps, we haven’t been able to use the iPads, and they’re available on Google chrome,” or responsiveness of design (e.g., virtual fieldtrips were abandoned by one teacher because she found it “big and boring”). Other challenges existed because of the timeliness of support. Unlike Uluyol and Sahin (2016), who a found lack of support as an external barrier, these teachers reported that new technologies are being supported on a regular basis, but that there is a time delay between implementation and training, as evidenced in the data. These challenges can be addressed through professional development and opportunities for collaboration with colleagues. Support needs to be readily available for teachers to incorporate technologies early in their practice rather than later. Aldunate and Nussbaum (2013) found that teachers who incorporated technologies early were more likely to continue with more complicated systems rather than abandoning them altogether. The prevailing themes connected to internal barriers in this study were teacher readiness (“Not enough. Because I’m old,” and “I still have a little phobia”), perceived tension between technology or in-person (“The problem is with that stuff; they’re not getting this stuff. You can’t do both”), devaluing online experiences (“They want experience, not the same thing”), and even negative attitudes toward technology (“I don’t because I don’t like that”). Teachers who devote much time to carefully and effectively implementing the curriculum require both direction and support to positively impact their beliefs about the value and significance of technology as a necessary part of the learning process for students. This impact on beliefs is essential, considering the constant production and evolution of technology that some teachers find overwhelming. In conclusion, disconnect appears to exist between beliefs and practice, as teachers believe technology is important, but do not implement it in practice to effectively meet the needs educators wish to address, such as developing 21st-century learning skills and motivating students to continue pursuing science as an area of study. In addition, teachers have good CK, PK, TK; however, there are concerns raised by teachers themselves about their competencies (in TPK, TCK, and TPACK) to use technologies to maximize learning for their students. Our findings contribute to the ongoing discussion among STEM education researchers and practitioners to increase understanding of the kinds of technology that are most beneficial for students of STEM in middle school. Aligned with the call of many other scholars (Badia, Meneses, & Sigales, 2013; Buckenmeyer, 2010; Hechter & Vermette, 2014; Özdemir, 2016; Uluyol & Sahin, 2016; Ward & Parr, 2010; Zimlich, 2015), teachers must receive more and ongoing professional development in the area of technological integration. In order to witness significant changes related to teacher technology use, professional development initiatives will have to specifically target teachers as the primary recipients. The professional development should take different forms and focus, housed under the umbrella of a TPACK framework, including contextualizing technology integration (Ruggiero & Mong, 2015); utilizing technology, introducing technology to students, and considering educational purposes of technology (Kong & Song, 2014; Zimlich, 2015); providing opportunities to learn from peers in terms of how to effectively integrate technology (Lin, Lin & Lee, 2015); and building confidence in and exploring benefits of using ICT rather than focusing on skills (Ward & Parr, 2010). Furthermore, findings of this study can inform curriculum development, teacher education programs, and outreach programs as to the types of technology and effective implementation in terms of TPACK for engaging students (especially girls) and promoting STEM career pathways. Aldunate, R., & Nussbaum, M. (2013). Teacher adoption of technology. Computers in Human Behavior, 29, 519-524. Badia, A., Meneses, J., & Sigales, C. (2013). Teachers’ perceptions of factors affecting the educational use of ICT in technology-rich classrooms. Electronic Journal of Research in Educational Psychology, 11(3), 787-808. Baturay, M. H., Gökçearslan, S., & Sahin, S. (2017). Associations among teachers’ attitudes towards computer-assisted education and TPACK competencies. Informatics in Education, 16(1), 1-23. Buckenmeyer, J. A. (2010). Beyond computers in the classroom: Factors related to technology adoption to enhance teaching and learning. Contemporary Issues in Education Research, 3(4), 27-36. Creswell, J. W. (2014). Research design: Qualitative, quantitative and mixed methods approaches (4th ed.). Thousand Oaks, CA: Sage Publications Inc.
DeCoito, I., & Richardson, T. (2016). Focusing on integrated STEM concepts in a digital game. In M. Urban & D. Falvo, (Eds. ), Improving K-12 STEM education through technological integration (pp. 1-23). Hershey, PA: IGI Global. deMarrais, K. (2004). Qualitative interview studies: Learning through experience. In K. deMarrais, & S.D. Lapan (Eds. ), Foundations for research: Methods of inquiry in education and the social sciences (pp. 51-68). Mahwah, NJ: Lawrence Erlbaum Associates, Inc.
Erkut, S., & Marx, F. (2005). 4 schools for WIE (Evaluation Report). Wellesley, MA: Wellesley College, Center for Research on Women. Government of Ontario. (2014). Technology in classrooms helping students succeed: New fund will improve access to leading-edge learning tools. Toronto, ON: Queen’s Printer. Günes, E., & Bahçivan, E. (2016). A multiple case study of preservice science teachers’ TPACK: Embedded in a comprehensive belief system. International Journal of Environmental and Science Education, 11(15), 8040-8054. Hango, D. (2013). Gender differences in science, technology, engineering, mathematics and computer science (STEM) programs at university. Ottawa, ON: Statistics Canada. Hechter, R., & Vermette, L. A. (2014). Tech-savvy science education? Understanding teacher pedagogical practices for integrating technology in K-12 classrooms. Journal of Computers in Mathematics and Science Teaching, 33(1), 27-47. Higgins, S., Xiao, Z., & Katsipataki, M. (2012). The impact of digital technology on learning: A summary for the Education Endowment Foundation. Londo, UK: EEF. Iskander, T. E., Gore, P. A., Furse, C., & Bergerson, A. (2013). Gender differences in expressed interests in engineering-related fields ACT 30-year data analysis identified trends and suggested avenues to reverse trends. Journal of Career Assessment, 21(4), 599-613. Jimoyiannis, A. (2010). Designing and implementing an integrated technological pedagogical science knowledge framework for science teachers’ professional development. Computers & Education, 55(3), 1259-1269. Khan, S. (2011). New pedagogies on teaching science with computer simulations. Journal of Science Education and Technology, 20(3), 215-232. Koehler, M.J., & Mishra, P. (2005). What happens when teachers design educational technology? The development of technological pedagogical content knowledge. Journal of Educational Computing Research, 32, 131-152. Kong, S. C., & Song, Y. (2014). The impact of a principle-based pedagogical design on inquiry-based learning in a seamless learning environment in Hong Kong. Educational Technology & Society, 17(2), 127-141. Kyriakides, A. O., Meletiou-mavrotheris, M., & Prodromou, T. (2016). Mobile technologies in the service of students’ learning of mathematics: The example of game application A.L.E.X. in the context of a primary school in Cyprus. Mathematics Education Research Journal, 28(1), 53-78. Lin, S., Lin, C., & Lee, D. (2015). The relationship between elementary school teachers’ technology readiness and intention to use social media platforms for classroom management. International Journal of Organizational Innovation, 8(1), 48-63. Mills, J.M., Durepos, G., & Wiebe, E. (2010). Encyclopedia of Case Study Research. Thousand Oaks, CA: Sage Publications Inc.
Mims-Word, M. (2012). The importance of technology usage in the classroom, does gender gaps exist. Contemporary Issues in Education Research, 5(4), 271-278. Mistler-Jackson, M., & Songer, N. B. (2000). Student motivation and internet technology: Are students empowered to learn science? Journal of Research in Science Teaching, 37(5), 459-479. Nordin, H., & Faekah, T. A. T. (2016). Validation of a technological pedagogical content knowledge instrument in a Malaysian secondary school context. Malaysian Journal of Learning and Instruction, 13(1), 1-24. Özdemir, M. (2016). An examination of the techno-pedagogical education competencies (TPACK) of pre-service elementary school and preschool teachers. Journal of Education and Training Studies, 4(10), 70-78. Ritzhaupt, A. D., Dawson, K., & Cavanaugh, C. (2012). An investigation of factors influencing student use of technology in K-12 classrooms using path analysis. Journal of Educational Computing Research, 46(3), 229-254. Rosen, Y. (2009). The effects of an animation-based on-line learning environment on transfer of knowledge and on motivation for science and technology learning. Journal of Educational Computing Research, 40(4), 451-467. Ruggiero, D., & Mong, C. J. (2015). The teacher technology integration experience: Practice and reflection in the classroom. Journal of Information Technology Education: Research, 14, 161-178. Sadler, P. M., Sonnert, G., Hazari, Z., & Tai, R. (2012). Stability and volatility of STEM career interest in high school: A gender study. Science Education, 96(3), 411-427. Saudelli, M. G., & Ciampa, K. (2016). Exploring the role of TPACK and teacher self-efficacy: An ethnographic case study of three iPad language arts classes. Technology, Pedagogy and Education, 25(2), 227-247. Shroff, R. H., & Vogel, D. R. (2009). Assessing the factors deemed to support individual student intrinsic motivation in technology supported online and face-to-face discussions. Journal of Information Technology Education, 8, 59-85. Stake, R. (2000). Case studies. In N. K. Denzin & Y. S. Lincoln (Eds. ), Handbook of qualitative research (pp. 435-454). Thousand Oaks CA: Sage Publications. Uluyol, Ç., & Sahin, S. (2016). Elementary school teachers’ ICT use in the classroom and their motivators for using ICT. British Journal of Educational Technology, 47(1), 65-75. Voogt, J., Fisser, P., Pareja Roblin, N., Tondeur, J., & van Braak, J. (2013). Technological pedagogical content knowledge – a review of the literature. Journal of Computer Assisted Learning, 29(2), 109-121. Wang, S., & Reeves, T. C. (2006). The effects of a web-based learning environment on student motivation in a high school earth science course. Educational Technology Research and Development, 54(6), 597-621. Ward, L., & Parr, J. M. (2010). Revisiting and reframing use: Implications for the integration of ICT. Computers & Education, 54(1), 113-122. Weber, K. (2012). Gender differences in interest, perceived personal capacity, and participation in STEM-related activities. Journal of Technology Education, 24(1), 18-33. Weber, K., & Custer, R. (2005). Gender-based preferences toward technology education content, activities, and instructional methods. Journal of Technology Education, 16(2), 55-71. Zimlich, S. L. (2015). Using technology in gifted and talented education classrooms: The teachers’ perspective. Journal of Information Technology Education: Innovations in Practice, 14, 101-124.